Tiniest of the diving ducks! 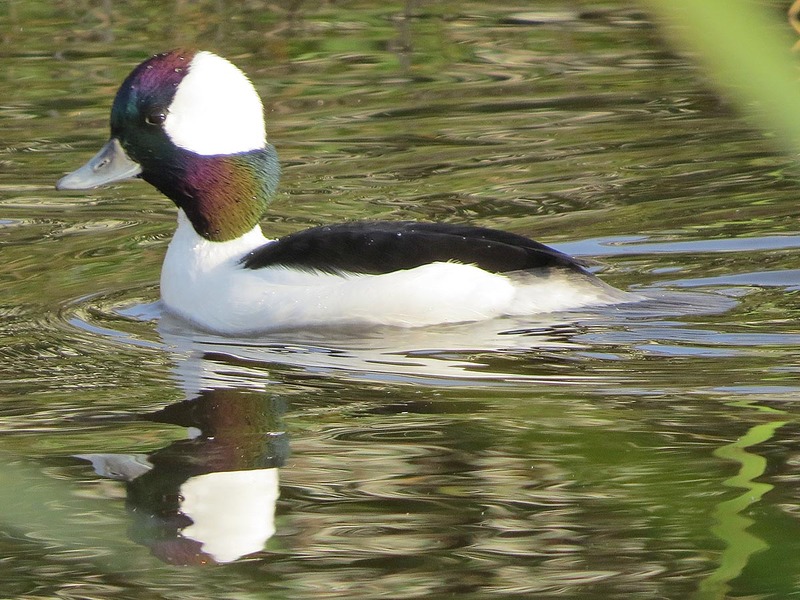 This month, the Bufflehead returns from the boreal forests of Canada and Alaska to winter in our waters. Its nicknames include little black-and-white duck, bumblebee duck, buffalo-headed duck, butterball, and spirit duck. Buffleheads have elaborate courtship displays that they perform throughout the year, except during the post-breeding molt and in the early fall. Sign up for Weekly Preview, and see photos for the week to come! If you'd like to make a gift to BirdNote, begin here. Thanks! During this season, a small diving duck returns from the boreal forests of the north to winter in our waters. It’s called the Bufflehead. This bird comes with many nicknames such as: little black-and-white duck, bumblebee duck, buffalo-headed duck, butterball, and spirit duck. Taken together, these names well describe the Bufflehead. The name “little black-and-white duck” highlights the bird’s striking plumage. Its black head, which shimmers with iridescent green and purple, sports a large patch of pure white. “Bumblebee duck” implies that this is the smallest diving duck in North America, and its nickname further suggests its fast, buzzy flight. 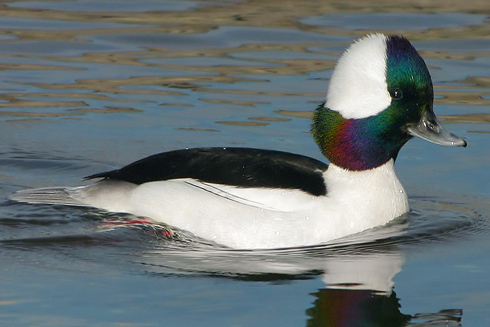 The common name “Bufflehead” is a corruption of the bird’s original name, Buffalo Head, a reference to the disproportionately large domed head of the male. [Sounds of the Bufflehead] Hunters use the nickname “butterball” to describe how fat the bird can be when prepared for eating. Finally, “spirit duck” came from the Bufflehead’s apparently supernatural ability to dive to safety as soon as it saw the flash of the old muzzleloaders. Flight sounds of the Bufflehead provided by The Macaulay Library of Natural Sounds at the Cornell Lab of Ornithology, Ithaca, New York. Recorded by L.R. Gunn. Migration happens once every year. And then again maybe six months later.